It has never been simpler to quit your job and make money your way by being part of the You Economy. Whether a true entrepreneur, a freelancer, or a consultant, we now have mature, easy-to-use technology that gives us inexpensive access to live life on our terms. That’s right, we can be successful, make more money, build our legacy, and quit the standard job. A quick bit of terminology is in order, as you’re going to see me refer to Cogs and Grinders. Cogs work day in and day out for someone else. They work toward someone else’s goals and build someone else’s legacy. Grinders don’t. Grinders work on their own goals, their own success, and their own legacy. Grinders embrace the You Economy. Years ago, I quit my steady corporate job. I have been able to design a life that is vastly more successful and balanced. It’s an absolutely thrilling way to live, and undoubtedly something you can achieve yourself. I mastered the 3 fundamental skills. I worked hard on these skills, and as a result, I make money in more enjoyable ways. Better yet, I found more time for my family, passions, and hobbies. I’m healthier, happier, and richer. Success in my ventures haven’t been one-time events. There is clearly a model to doing this right. A success model for quitting your job and making money doing the things you’re passionate about. What has this success model done for me? I’ve made it to the other side, and yes…the grass is greener. These principles allowed me to “break out” from the standard day-job mentality. This is a very scary proposition for many; it was for me too. I provided the sole income for my wife and small child. I was already making good money. I was comfortable. I was stable. I had been conditioned early to work hard at school, go to college, keep going to school, grind it out 9-5…or in reality, 7-5+. I just needed to keep working my way up the corporate ladder. The only thing is, the further I made it up the corporate ladder, the more I realized I was missing out on the life I wanted to live. I was fulfilling someone else’s dream and legacy. It was time to build my own legacy. Do you have an itch—a realization even—that this isn’t all life is about. Do you wonder, isn’t there something more? Can you do better with this one life? You know time is your most valuable asset. You know that spending the majority of your waking time working for someone else’s dream won’t let you achieve the life you want. You are ready for more than a job. You are ready to enter a realm that will be more rewarding, more exciting, more personal. You are ready for something that will make you a fortune. While I hope this allows you to completely quit your job and spend as much time as you want on projects that excite you, I realize that can be a daunting proposition. If you’re not quite ready, this post will give you plenty. Quit your day job altogether and start your own business as an entrepreneur, freelancer, or consultant. Be a rock star at the job you already have, opening your career possibilities. Create a book, software, or other intellectual property. Enjoy freedom and the best life has to offer. Without further ado, here are the three skills you need to master in order to quit your job and join the You Economy. I’ve been through a lot of standard education, including an MBA and numerous professional programs. What was the biggest gap in all of the standard education? Mindset. And that’s too bad, because mindset is simply the critical foundation for leaving the grind behind. It is the ingredient most of us miss in our standard upbringing and education. And face it, you probably already have better circumstances than many others who have already left the grind behind and quit their job. So why them and not you? I’m talking unparalleled drive, focus, motivation, and mental acuity. You can learn all of this and you can mold your mindset. This is accomplished by introducing and sticking with a particular set of daily habits. These habits should shock you in terms of how much they change your life. Your energy and excitement should be palpable. Your attitude contagious and infectious. You should be ready to explode, leaving your mark on the world. After all, you can read all of the practical advice in the world, but unless you have the mindset to take action, you’ll never become a Grinder. So get ready to work on the way you process the world. Mindset also helps us better understand risk. Most of us completely misunderstand the risks of quitting our jobs. Most of us see becoming a Grinder as a fantasy—not something regular people do. I’m far from alone in my approach to working your mind first. The practices in this book are used by NASA, US Olympic teams, doctors, the $100B US advertising industry, and literally all of the exceptionally successful people I know. In fact, Thomas C. Corley conducted a five-year study of self-made millionaires which concluded, “Thinking is the key to their [self-made millionaires] success.” Specifically, the study found these subjects typically dedicate 15-30 minutes each day to focusing their mental energy deeply and personally on their success. A word of caution though: other books and programs push the seductive idea that all you need to do is imagine your future and it will happen. While deliberate thinking is vastly important, it is not sufficient on its own. On top of having clarity, purpose, and focus, you also need to take corresponding action. The mind is what matters. The mind is what separates. The mind is it. 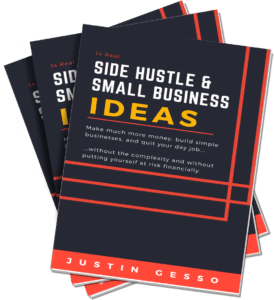 The Grinder Master’s Course, which provides a list of other books that give the right information on molding your mind for success and making money on your own. 100 Steps to Quit Your Job in 1 Year, which is an actionable PDF. Daily and weekly habit tracker worksheets. We’ve all heard this saying, and if you want to quit your job, you’ll need to live and breathe it. Even though this concept applies to the standard-job world, it applies doubly so to the Grinder world and the You Economy. Humans progress because we learn and advance from those that came before. Grinders know this and don’t re-invent the wheel. Your network gives you the ability to level-jump results, avoid pitfalls, and leverage others’ connections. I’m an introvert by nature, so I can assure you this is not about going door-to-door or making cold calls. This is about smartly and meaningfully connecting with your network. And I assure you that if you apply the principles in this section, you’ll build a massive safety net that will help you break ties with the grind. No one is successful in isolation. We all rely on people to provide feedback, improve our results, or simply to just buy our products and services. 1. A personal board of directors…a Mastermind Group. A group of trusted peers all working together toward your and each other’s success. 2. A mentor…someone who has been there and done that successfully. Someone who will take you under their wing, guide you practically, and introduce you to the right people. Quitting your job is a huge deal, with huge rewards. If you took on a huge project at work, you wouldn’t go it alone, would you? No, so don’t handle this differently. Engage a trusted team in your success and you will massively reduce your risk and improve your chances of an exceptional outcome. 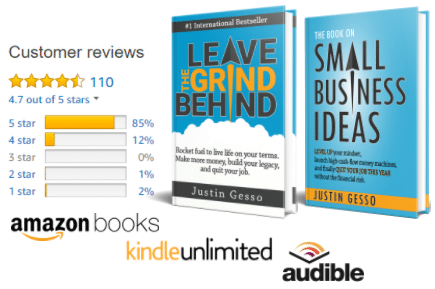 Just like with the Mindset section, you can get everything you need to know about mastering Mentors and Mastermind Groups in my book Leave the Grind Behind. I have a lot of You Economy friends. One of the most noticeable things they do differently than Cogs is they take action ruthlessly and get stuff done. They don’t necessarily spend more time working (in fact, many work far fewer than 40 hours per week), they just work on the right stuff and constantly move forward. While some of us might fiddle around with the idea of starting a blog for the next year, you can bet there’s a Grinder out there who just gets started. And in that same year, they’ve created a successful blog, several books, and a couple of offshoot products. They’re rolling in it, while you’re still thinking about it. But what if you don’t know what to do yet? No doubt, it’s tough to quit your job and take off on something adventurous and exciting. But you can do a surprising amount in your current situation to prepare for the moment you leap. So realize the positives in your current situation and get the most from it before quitting. Take action now; don’t wait. In other words—if you’re not sure what you want to do once you quit your job, don’t use that as an excuse to sit idle. Use your time and current job to develop valuable expertise and connections. Even though I always knew I wanted to quit working in a standard environment and become a Grinder, the reality was I had no idea how I was going to make money on my own. While I worked through this challenge using the mental concepts mentioned earlier, I also focused on the practical side by gaining everything I could from my Cog job. Are you maximizing your time in your Cog job? There is one question to ask yourself to determine this: am I comfortable or uncomfortable? To all external appearances, unfit and unqualified. These feelings are a good barometer for whether or not you’re expanding your comfort zone, learning, and focusing on self-improvement. This is a terrible approach, and it has “Cog” written all over it. This is no way to learn, improve, or expand. Rather, if you are not where you want to be at a company—whether entry-level or VP—put your positive mindset to work and get everything you can out of it. In general, if you approach your job as a way to grow, learn, and experiment, you will end up helping your company and yourself. You will be on the Grinder fast track. On top of maximizing your current situation, you’ll want to learn how to properly take massive action. This means working on the things that get you results. It means working efficiently and ruthlessly. It also means maintaining a balanced and fulfilling life. Being efficient and freeing up time and money to transition from your 8-5 job to a You Economy job. Taking big action consistently, focusing on what delivers results. Learning the skills that Grinders need: execution, sales, and marketing. Knowing how to make money work for you. Embracing scalability and passive income…building a money machine. How to invest, particularly in real estate. And by now, you probably guessed it. You’ll get much more detailed information on this in my book Leave the Grind Behind. The freebies you get now will also dive into taking action effectively. Thanks to technology, the new gold rush is on. Get in on the You Economy. Quit your job, do something more meaningful, make much more money, and live a more balanced life.